The latest in Disney’s current trend of remaking their old animated classics in live-action, following last year’s Cinderella and soon to continue with new renditions of Beauty and the Beast, Mulan, Dumbo, Pinocchio and countless others in development, The Jungle Book was always going to have a divisive build-up. Not only would extreme fans of the original 1967 cartoon adaptation of Rudyard Kipling’s source material be wary of seeing its colourful characters and timeless songs performed by real people – or, in this case, a whole bunch of CGI animals and one real person – but also purists of Kipling’s classic piece of literature would once again moan about how this new version would not stay true to what the author actually wrote, instead taking more of its cues from – you guessed it – the cartoon version, which was already not the most faithful adaptation (keep in mind, we have not read Kipling’s book, and we are reviewing this film as well as the previous one on their own merits). Luckily, for the most part, any fears that Jon Favreau’s new version of The Jungle Book would in any way pale in comparison to what came before should be put to rest, as it is an extremely fun and entertaining family film that even manages to surpass areas that the 1967 version, as much as it holds a special place in our hearts, treaded upon. The story is virtually the same as before: a young “man-cub” named Mowgli (Neel Sethi, the only physical human actor in the entire film) lives in the jungle with his adoptive wolf family, including mother Raksha (Lupita Nyong’o) and a pack led by Akela (Giancarlo Esposito), but when the ferocious and vengeful tiger Shere Khan (Idris Elba) declares his intent to kill the man-cub the first chance he gets, Mowgli is forced to leave and, accompanied by the wise panther Bagheera (Ben Kingsley) and soon the lazy bear Baloo (Bill Murray), find his place in the nearby man-village – or so it would seem, if Mowgli weren’t so keen to stay in the place he’s called home all his life. In more than one sense, you can make the reasonable argument that this new version is a wildly unnecessary remake, one that – much like Cinderella last year – has no real reason to exist other than the property is synonymous with Disney. While that argument is definitely valid, you can also suggest that this is also a solid 21st century update of the previous film, taking themes, characters and even set-pieces from the original and injecting new life into them while always staying mostly true to what made them so unforgettable in the first place. Case in point, when one does look back on that previous Disney version of The Jungle Book, it does have some problems, many of them lying in its very basic story and character department. For instance, at 78 minutes, it can feel very rushed and even episodic, with many characters such as the wolves – who, having raised the main character, should be a little more integral to the story – getting all but shoved aside so the plot can quickly get from point A to point B, even then displaying very basic character traits in the likes of Baloo, Bagheera and especially Mowgli without a lot of depth or real understanding of who they really are. 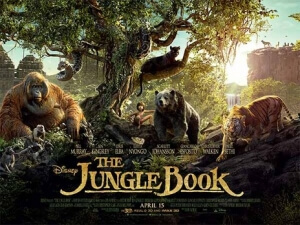 This new version, which clocks in at roughly an hour and forty-five minutes, has more time to develop connections between the characters, which you definitely feel between characters like Mowgli and Baloo, as well as further developing the characters themselves, not to mention giving the on-screen story a bit more weight to it than just simply having it be a carbon copy of the admittedly thin plot of the original. As a result, they become more interesting and sometimes even more lovable than their previous incarnations, particularly Murray’s Baloo who might be the first case of being a realistic-looking CG bear you actually want to cuddle in your sleep, but other times a little more threatening as is definitely the case with Scarlett Johansson’s all-too-brief appearance as the hypnotic snake Kaa – who has a very fascinating way of “seducing” the young man-cub this time round – and especially Elba as Shere Khan, who in addition to being voiced with the right amount of arrogance and swagger by the actor is also rendered in a way that makes him extremely intimidating and even sinister (just watch one scene where he’s watching over a small pack of wolf cubs without getting chills). It is also, as you may expect, absolutely beautiful to look at. Perhaps the best realised CG world since Avatar, and maybe even surpassing James Cameron’s box-office titan, there is not one piece of scenery or even character that looks like it’s not really there, and even in the instances you can tell it’s unmistakably CGI it’s still so impressive and the characters and story so charming that you honestly don’t care. It is absolutely recommended you try and see this in IMAX 3D, where each little environment is displayed with such detail and wonder that you have to keep convincing yourself it’s not actually real, as much as we want it to be (the ending credits also seem to be trolling us by saying it was all filmed in downtown LA, which goes to show how impressive it truly looks). And yes, for all the Disney fans out there, there ARE indeed songs from the previous film featured in this; you’ve got Murray singing “The Bare Necessities”, arguably the most famous song from that film, in a way that fits surprisingly well into the otherwise non-musical world they’ve established; and perhaps a little more bizarrely, an out-of-nowhere rendition of “I Wanna Be Like You” as sung by Christopher Walken’s Gigantopithecus – basically a large Orangutan – King Louie (which, by the way, is our latest contender for The Greatest Thing Ever™, especially with an actual cowbell that summons Walken’s presence in the film), which is so strange and quirky it needs to be seen to be believed. They will undoubtedly put smiles on the faces of anyone who grew up loving those songs, which by significant judgement should be the majority of people going to see this. As we mentioned, we highly doubt that anyone who was never a huge fan of the previous Disney version would be fully on board with this new version, and the same especially goes for anyone who’s a die-hard Kipling fan as from what we understand this has as much to do with the original book as the original did (for those whining, Andy Serkis is currently working on a motion-capture version that’s said to be much closer to the book, so just be patient, you’ll get your faithful adaptation soon enough), but for everyone else The Jungle Book is solid family entertainment that will make everyone watching it feel like they’re little kids again, singing and dancing along to The Bare Necessities without a care in the world. The Jungle Book is a fun and enjoyable family film that updates certain aspects of the beloved Disney animated version and even improves upon a lot of them, incorporating them into a fantastically-realised CG world that is truly astonishing to look at, while never letting go of what made the original so memorable and unforgettable to begin with.